Attendees of the Dr. Who Panel at the Armageddon Expo in Auckland yesterday are saying that Sylvester McCoy has confirmed that he has been cast in the role of Radagast the wizard in “The Hobbit.” Rumors have been flying about McCoy having auditioned, some thinking he might have even been cast as Bilbo. 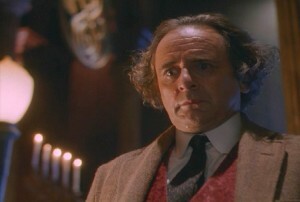 As early as August, McCoy started hinting that he had been been cast in a role that was not Bilbo. However earlier this week it started leaking in earnest (from McCoy himself), that he had been cast as Radagast. Confirming the news yesterday at Armageddon adds one more piece to the casting puzzle and confirms that Radagast the Brown, contemporary of Gandalf and Saruman and lover of nature and animals, will indeed be part of “The Hobbit” movies. Thanks to message board member, Earl, for the great tip! Here’s more confirmation lending veracity to the above story. The New Zealand Herald is reporting that Sylvester McCoy flew out to Wellington last Thursday to meet with PJ and Philippa about The Hobbit, and he confirms that he has been cast as Radagast the Brown, but he hasn’t signed any contracts yet. His journey into Middle-earth began back in 2007 when he met Peter Jackson during the New Zealand tour of the Royal Shakespeare Company’s production of King Lear.